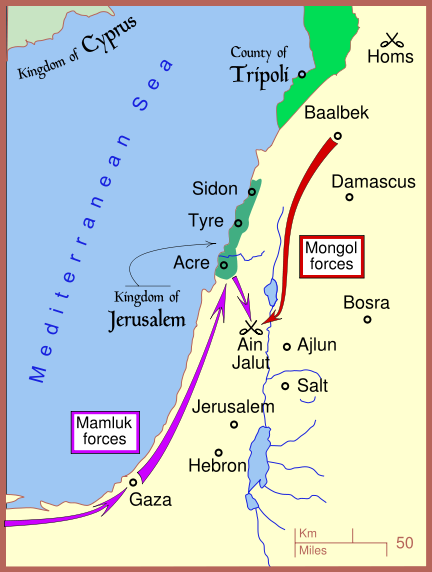 The Battle of Ain Jalut (or Ayn Jalut, in Arabic: عين جالوت, the "Spring of Goliath") took place on 3 September 1260 between the Egyptian Mamluks and the Mongols in Palestine, in the Jezreel Valley, not far from Ein Harod. This battle is considered by many historians to be of great macro-historical importance, as it marked the highwater point of Mongol conquests, and the first time they had ever been decisively defeated. After previous defeats, the Mongols had always returned and avenged the loss, but after the Battle of Ain Jalut they were unable to do so. The Mongol Ilkhanate leader Hulagu Khan was not able to advance into Egypt, and the Khanate he established in Persia was only able to defeat the Mamluks once in subsequent expeditions, briefly reoccupying Syria and parts of Palestine for a few months in 1300.